What is the difference between physics and engineering? Physicists usually seek to understand how physical things work--like atoms and nuclei, solids and liquids, rigid macroscopic objects, and even stars and galaxies. Physicists generally want to identify and measure important characteristics of things that exist in nature. Physicists often pursue knowledge for knowledge's sake, although very frequently that pursuit does lead to important technologies. Engineers, on the other hand, are typically most concerned with creating new devices, structures, and system designs using knowledge about how the world works. Since that knowledge generally comes from the work of scientists like physicists and chemists, engineering is deeply tied to these fields. What engineers do, though, is take those principles that scientists uncover and apply them to the solutions of complex real-world problems--and therefore it is critical that successful engineers have a solid understanding of the science which underlies their work. Computer engineering is a mashup of computer science and electrical engineering. It tends to focus more on the devices such as microprocessors, embedded computing devices that are finding their way into everything these days to traditional laptops and desktops. Beyond that, computer engineers devise ways for the various components to communicate. One might say that computer engineers are electrical engineers that specialize in hardware design and the software required to integrate systems of hardware and software. Computer science is a discipline that spans theory and practice. It requires someone to think abstractly and concretely. The software developed by computer scientists can be seen everywhere these days, in our phones and cars and refrigerators as well as our desktops. But computer science can be thought of at a higher level, as a science of problem solving. Computer scientists must be adept at modeling and analyzing problems. They must also be able to design and implement solutions by writing software and then verify that the solutions are correct. While chemistry and chemical engineering technically exist as separate disciplines in different departments, the distinctions between chemistry and chemical engineering have been blurring in recent years. The old stereotypes were that the chemists designed synthetic and purification protocols, and the chemical engineers designed the plants where chemicals are synthesized and stored. Chemists made things on a laboratory scale; engineers made them on an industrial scale. These stereotypes do not strictly hold anymore. Both chemists and chemical engineers now synthesize and study molecules on various scales, and in some research teams, it is difficult to distinguish between the chemists and the chemical engineers in the group. Both chemists and chemical engineers are also involved in scale-up and process design. A key difference between chemistry and chemical engineering continues to be the increased mathematical sophistication and competence among the chemical engineers. Chemical engineers also tend to earn higher salaries compared to chemists. Careers can be similar as well, especially at comparable degree levels. There seems to be fewer academic career opportunities for chemical engineers, mostly due to the fact that undergraduate chemical engineering programs are more rare at comprehensive regional universities and selective liberal arts colleges. In general, how is science different from engineering? There are lots of connections between engineering and science. Engineering provides questions for science to try to tackle. Science helps engineers further their designs through the development and improvement of different materials and structures. Improved designs then can be used to develop better scientific tools. 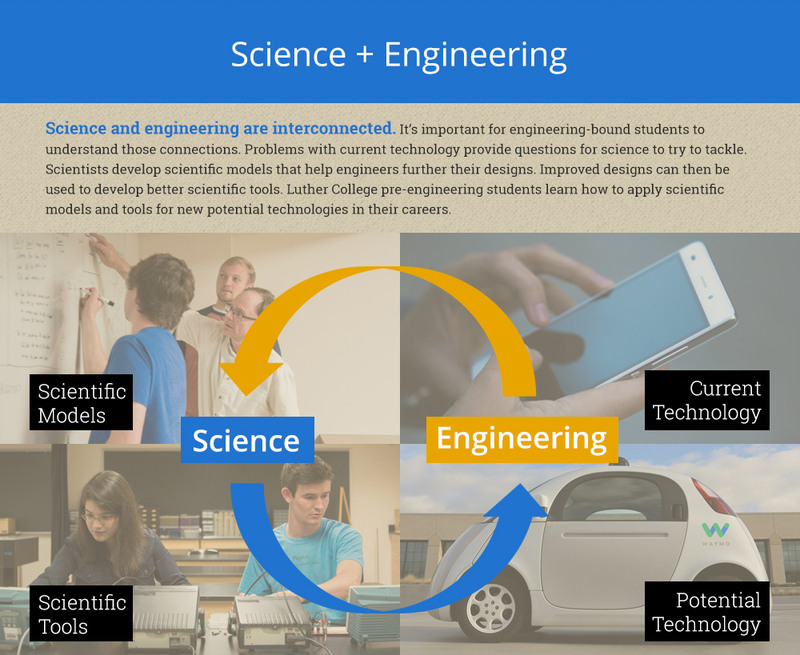 So science and engineering are closely linked and interact synergistically. Can I really make it as an engineer if I have a Bachelor's degree in science? Yes! Becoming a successful engineer requires a strong foundation in science and mathematics, so a bachelor's degree in physics or another science can be a great way to develop that strong foundation. Over half of our physics graduates and about five percent of our chemistry graduates go on to graduate programs in engineering and become practicing engineers.